Howdy friends....I do not make scrapbooking layouts, I make cards!!! So, you are thinking this is a layout...OK, it is. I needed to make one for a project request. I had to come up with a layout with the focus not being my grandson, but die cuts. In the layout above I used Die-Versions Farm Animal Border at the bottom. Die cut twice and flipped one so the cows faced each other. The doily is a page from a dictionary die cut with Heart Burst. (LOVE how that turned out). 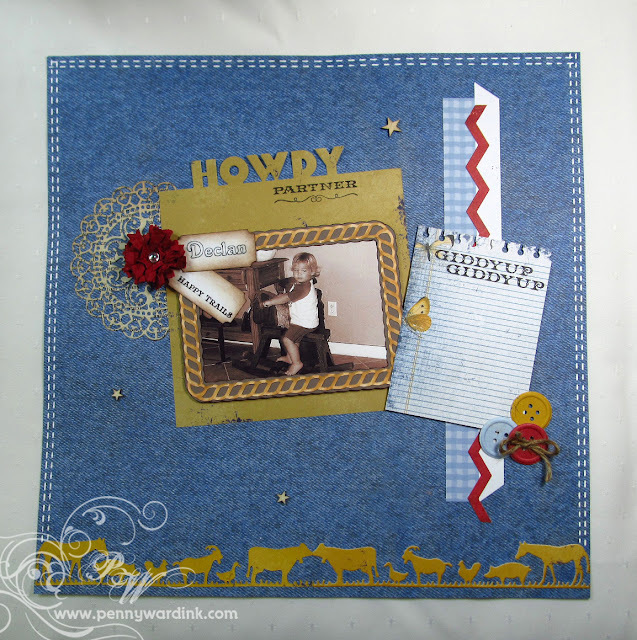 Howdy greeting is an Edge die, then used a stamp just below it for the greeting. Flower is a die cut from Spellbinders. Wet the card stock, crumple, dry with a heat gun, then build the flower. Zig Zag by Spellbinders also. Rope frame is a die cut from the Silhouette Store re-sized to fit the picture of my cute little grandson riding my wooden rocking horse. (It was his dads, so I guess you could call it an antique). The tickets are also cut and print with a Silhouette Cameo. Journal page is from Authentique and edge punched. Buttons are punched also. Faux stitching with a white gel pen and add twine for a more country look.